Even though I was feeling pretty good about my first "Block A" in the Modern Sampler Quilt quilt along, I was kind of dreading working on Block B. It had alot of pieces. I made the piecing easier by printing a mirror image that allowed me to paper-piece the rows 1 by 1. From there it was easy peasy. I do see 1 little piece I think is misplaced at the bottom of the center column, so I'll fix that one of these days. But otherwise, I'm pretty happy with where this quilt is heading! 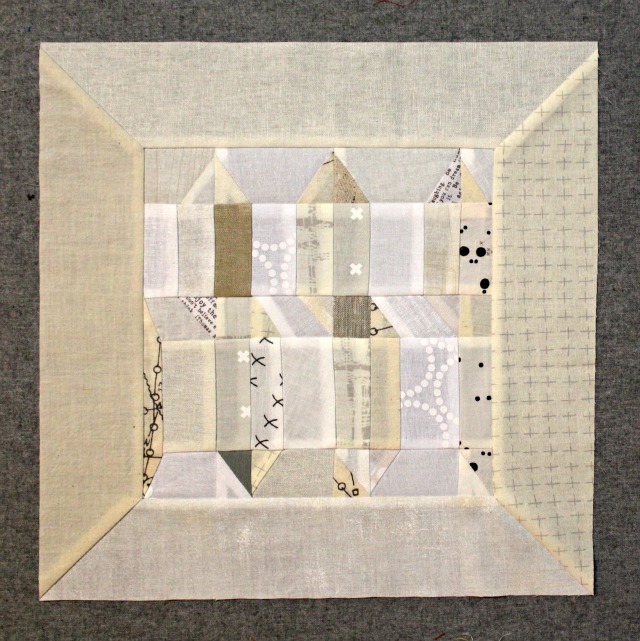 Linking up with the Modern Sampler Quilt link-up! it's a very cool block. good idea to paper piece it. lovely and serene, as always. You are so talented.....I love looking at all your creativity!! !